Say hello to one of the true heroes of Mushroom World! Yoshi, Mario's and Luigi's friend and ally. 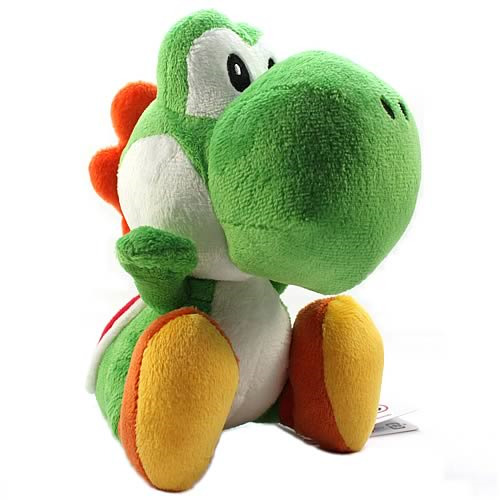 Green Yoshi is now an official Super Mario Plush Doll. Cozy up to Yoshi tonight! Say hello to one of the true heroes of Mushroom World! A true friend and ally of Mario and Luigi, Green Yoshi is now available in limited quantities as this cute and cuddly Super Mario Yoshi Plush Doll that measures about 8-inches tall. Cozy up to Yoshi tonight! Yoshi (sometimes specified as "Green Yoshi") is one of the heroes of Mushroom World and an ally of Mario and Luigi. He's a member of the Yoshi race and has aided his brethren in saving their homeland on multiple occasions. Yoshi has also saved other kingdoms from the villain Bowser, as well. In his youth, Yoshi managed to rescue and protect Baby Mario and Baby Luigi from the wrath of Kamek and the Koopa Troop. According to RPG Super Mario: Legend of the Seven Stars, Yoshi is the only one of his species that can speak the human language. However, in later games, he doesn't speak the human language (as evident in Mario Superstar Baseball and Mario Super Sluggers). This is contradicted once again in Super Mario Galaxy 2, when Yoshi speaks in perfect English. Yoshi made his very first appearance, game-wise, in the Super Mario World level Yoshi's Island 2.